Years ago, starting a Notary business using social media meant developing a profile and placing it on a website like SigningAgent.com, then waiting for the phone to ring. 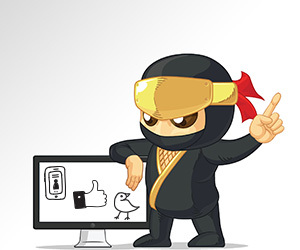 Nowadays, it almost seems like you must utilize social media like a ninja to get the exact business you want. After researching the definition of the word "ninja" and scraping away some of the more colorful definitions, the word simply means "a person who excels in a particular skill or activity." If you are going to be successful in today's Notary business world, you have to learn to adapt to the needs of your businesses. This means developing your craft into ninja status on social media platforms. Let's take a look at some of these social media tools that successful Notaries use for their business. Twitter — Twitter also focuses on your personal life as well as your business. It allows you to give and receive focused, short, and powerful bursts of information. It has proven to be a great tool for helping Notaries get noticed online. Yelp — This is fast becoming one of the Notary professional's best tools for attracting mobile Notary business. Having a Yelp profile allows potential customers seeking mobile Notary services to view how other people in your area rate your service. Yelp focuses on reviews by clients who use your business. People who use Yelp search for everything from mobile Notaries to contract closers. YouTube — Here's another little gold mine for mobile Notaries. YouTube is a website designed for sharing videos. Notaries can make a little commercial about their business, illustrating exactly what they can do, and how they can make lives better for potential customers. Check out the NNA’s online communities for some other great ideas to build your social media presence using different platforms. As you develop your own social media strategy, you may find these additional tools to be helpful in establishing and engaging an online audience for your Notary business. MailChimp — This is an online email marketing solution to help you manage your contacts and emails. It also allows you to track your results. SurveyMonkey — This is the world's most popular online survey software. It makes it easy to create polls and survey questionnaires for learning about anything from customer satisfaction to how you can improve your business model. Craigslist — This is a classified advertisement website with sections devoted to jobs, housing, personals, for sale, services, community, gigs, resumes, and discussion forums. This is a great website to help mobile Notaries grow their businesses because Craigslist users are looking to do some type of transaction. And as we all know, a Notary makes all transactions better and more reliable. Hootsuite — Hootsuite helps you organize and schedule messages for most social media accounts including Facebook, LinkedIn, and Twitter. Using basic social media tools like LinkedIn, Facebook, Twitter, and oh yes, SigningAgent.com, will help secure your Notary business success. What other sites would you use to develop your ninja skills? Daniel Lewis of Carmel, Indiana, is the founder of Lewis Notary Services Inc., a nationwide mobile service. 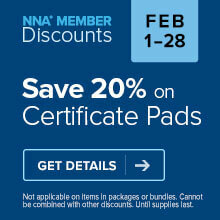 He also teaches Notary best practices and is a former NNA Notary of The Year. Notaries: Is Blogging Right For You? I am going on a year as a mobile notary and it seems like in the beginning I hit the ground running, and now business has come to an abrupt haunt since February 2015, with the exception of the occasional appointment. So frustrating, especially since I love doing this work. I do not know how to get out of this rut. Mona, I suggest you go on Amazon & get the book by Laura Vestanen on how to market your non-loan notary services. It's worth its weight in gold for the great ideas it contains. Also, go to the Small Business Administration website at sba.gov and look for Small Business Development Centers or SCORE chapters in your area; they can help you with business basics, including market research -- and their services are free to use as they're paid by our taxes. Good luck with your business.